Tonight, the radiant looking Duchess of Cambridge accompanied Prince William to the star-studded 72nd British Academy Film Awards, more commonly known as the BAFTAs at Royal Albert Hall in London. The Duke of Cambridge William is President of BAFTA since February 2010. The couple will meet BAFTA representatives and watch the ceremony. Presented by the British Academy of Film and Television Arts (BAFTA), the accolades are handed out for the best feature-length film and documentaries of any nationality screened at British cinemas in 2018. You can learn more about the royal involvement and Prince William’s tenure with BAFTA here. BAFTA plays an active role in Charities Forum, a group of Charities under the Patronages of Prince William, Duchess Catherine and Prince Harry. 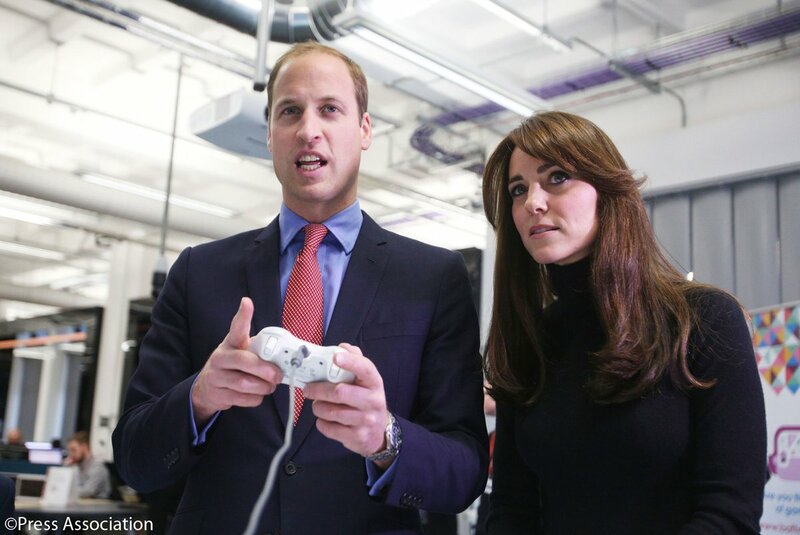 The royals have also supported BAFTA’s charitable activities by attending events across the charity’s learning programmes, including Young Game Designers and BAFTA Kids events. A video royal couple’s arrival where the meet with the BAFTA representatives. William and Catherine took their seats in the Royal Albert Hall. BAFTA is a world-leading, independent arts charity that brings the very best work in film, games and television to public attention and supports the growth of creative talent in the UK and internationally. 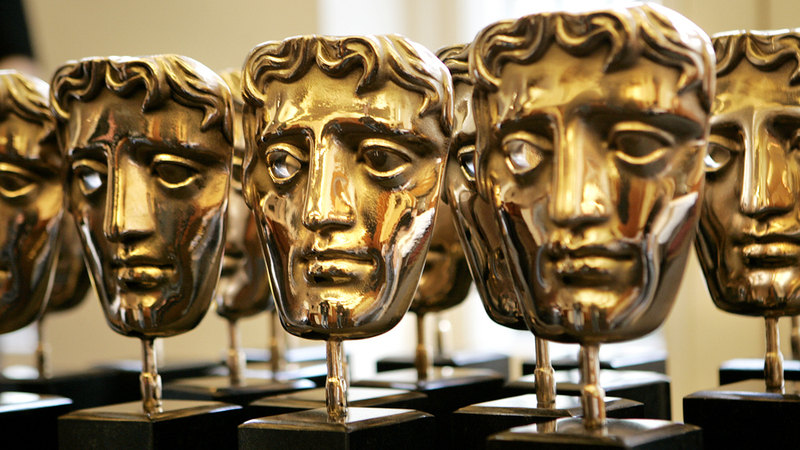 While BAFTA is well-known for celebrating excellence and championing creativity through its awards, it is a charity committed to identifying talented individuals, and making sure they receive the encouragement, professional support and advice that will enable them to succeed, regardless of their background or other circumstances. 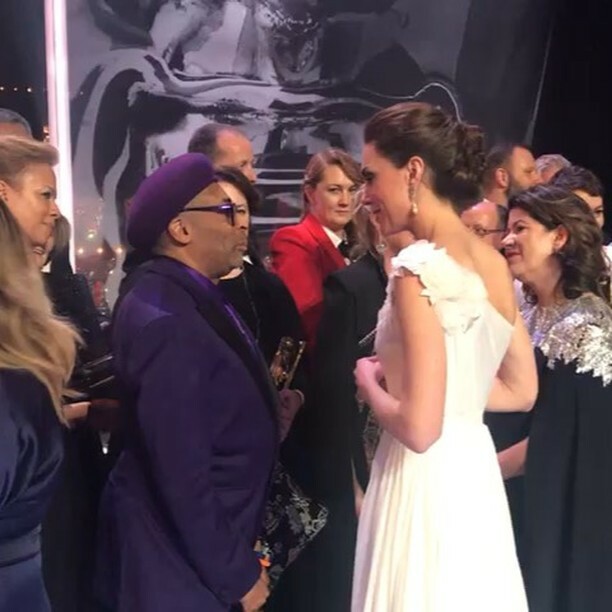 The Duchess of Cambridge congratulates Spike Lee, Director of BlacKkKlansman, which won the BAFTA Award for Best Adapted Screenplay. The Duke presented the BAFTA Fellowship to film editor Thelma Schoonmaker. The fellowship is the ceremony’s highest accolade bestowed by the Academy to an individual in recognition of an outstanding and exceptional contribution to film, television or games. After the awards couple met with the nominees and winners including Rami Malek, Bradley Cooper and Olivia Colman. For the start studded night, Duchess of Cambridge chose an extremely elegant and beautiful look. 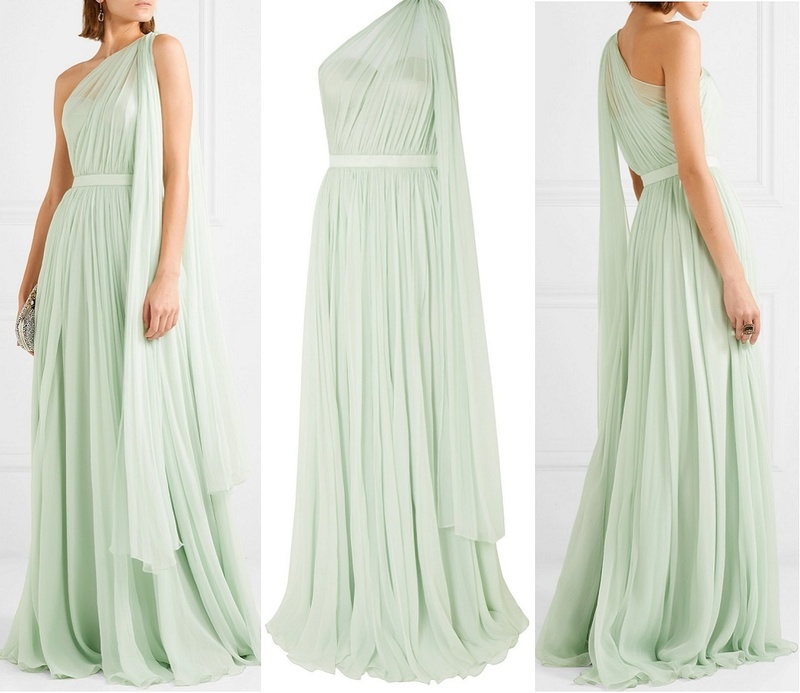 Catherine was wearing a ivory Grecian-style off shoulder Alexander McQueen gown. To me it was her one of the best evening looks. The gown is extremely beautiful. Must check the video of couple’s arrival where you will see it in motion. It is gorgeous. 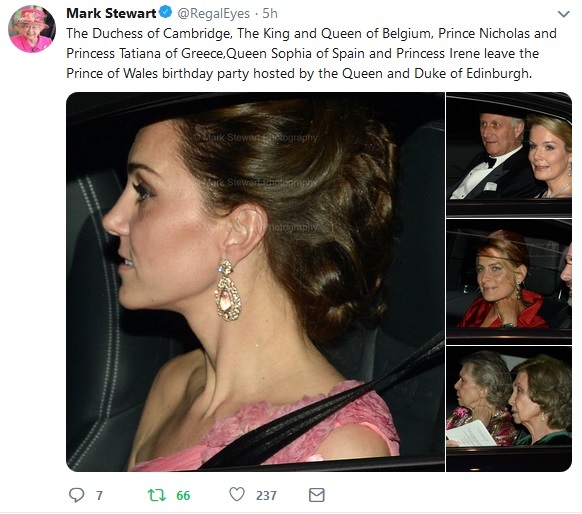 The design of the gown is similar to the pink gown Catherine wore in November 2018 at Prince Charles Birthday dinner hosted by the Queen at Buckingham Palace featuring a floral motif on the shoulder and ruffled detailing. Embed from Getty ImagesIt has beautiful flower detailing on the shoulder. A Closer look. Laura on Twitter shared the picture of this Alexander McQueen One-shoulder crinkled silk-chiffon and satin gown which has similar detailing as of Duchess’ gown. Duchess paired the outfit with statement earrings belonging to her late Mother-in-Law Diana, Princess of Wales. Thanks to Emma on Twitter for quick id. Earrings were actually a combination of two different pairs. She was wearing the upper detachable part of Diana’s earrings with another pair of pearls Diana wore. It looks the pearls worn by Diana in picture shown below. Princess Diana left her jewellery to her sons, in order that their future wives may wear and enjoy it. And, true to her wishes, the Duchess of Cambridge attended the BAFTAs wearing a pair of diamond and pearl earrings from the collection of her husband’s late mother. The earrings feature a double curve of various cuts of diamonds, with a cluster of marquise-cut stones in the centre, from which hangs a single pearl. Princess Diana wore the earrings with sizeable, silver-toned South Sea pearl drops on several black-tie occasions. She wore them with the Cambridge Lover’s Knot tiara, a piece the Duchess of Cambridge has also borrowed on several occasions, at a banquet for the Japanese Emperor Akihito in 1990, and again at a banquet in South Korea in 1992, when she paired them with the Spencer tiara she’d worn on her wedding day. The earrings appeared also during a visit to Pakistan in 1991, and at a gala at the Palace of Versailles in 1994. Embed from Getty ImagesA look at Duchess’ glamorous up-do. Duchess paired her outfit with Jimmy Choo Romy 100 Silver and Dusk Blue Fireball Glitter Dégradé Fabric Pointy Toe Pumps . Thanks to Laura on Twitter for her eagle eyed tip. The $725 pumps are mentioned as delivered with Chocolates on official online store. 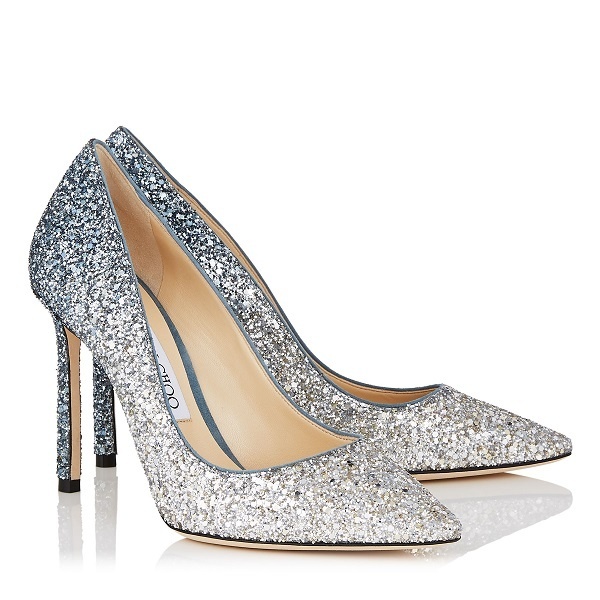 The pumps are described as, “Ombre and Silver Coarse Glitter Degradé Pointy Toe Pumps The classic pointy toe pump has been slightly updated with a softer point and a new stiletto heel. Leather lined with a leather sole, they are finished with a Ombre and silver coarse glitter degradé upper”. They are also available at Net-a-Porter. Embed from Getty ImagesCatherine was carrying a white clutch thought to be a bespoke Alexander McQueen piece. This is the 4th time Duchess has joined the Duke for the award ceremony. A look at Duchess’ previous appearance at the BAFTA. Next we will see Duchess on Wednesday at Mental Health in Education Conference and then later in the evening at 100 Women in Hedge Fund Gala Dinner. Embed from Getty ImagesI will leave you with these beautiful black and white shots of our beautiful Duchess.